For other people named Phil Hill, see Phil Hill (disambiguation). Philip Toll Hill Jr. (April 20, 1927 – August 28, 2008) was an American automobile racer and the only American-born driver to win the Formula One World Drivers' Championship (Mario Andretti, an Italian American driver, won the World Drivers' Championship in 1978, but was not born in the United States). He also scored three wins at each of the 24 Hours of Le Mans and 12 Hours of Sebring sports car races. Hill was described as a "thoughtful, gentle man" and once said, "I'm in the wrong business. I don't want to beat anybody, I don't want to be the big hero. I'm a peace-loving man, basically." Born in Miami, Florida, Hill was raised in Santa Monica, California, where he lived until his death. He studied business administration at the University of Southern California from 1945 to 1947, where he was a member of the Kappa Sigma fraternity. Hill left early to pursue auto racing, working as a mechanic on other drivers' cars. Hill began racing cars at an early age, going to England as a Jaguar trainee in 1949 and signing with Enzo Ferrari's team in 1956. He made his debut in the French Grand Prix at Reims France in 1958 driving a Maserati. That same year, paired with Belgian teammate Olivier Gendebien, Hill became the first American-born winner of the 24 Hours of Le Mans with Hill driving most of the night in horrific rainy conditions. He and Gendebien would go on to win the famous endurance race again in 1961 and 1962. Hill began driving full-time for the Ferrari Formula One team in 1959, earning three podium finishes and fourth place in the Drivers' Championship. In 1960 he won the Italian Grand Prix at Monza, the first Grand Prix win for an American driver in nearly forty years, since Jimmy Murphy won the 1921 French Grand Prix. This also turned out to be the last win for a front-engined car in Formula 1. The following season, Hill won the Belgian Grand Prix and with two races left trailed only his Ferrari teammate Wolfgang von Trips in the season standings. A crash during the Italian Grand Prix killed von Trips and fourteen spectators. Hill won the race and clinched the championship but the triumph was bittersweet. Ferrari's decision not to travel to America for the season's final round deprived Hill of the opportunity to participate in his home race at Watkins Glen as the newly crowned World Champion. When he returned for the following season, his last with Ferrari, Hill said, "I no longer have as much need to race, to win. I don't have as much hunger anymore. I am no longer willing to risk killing myself." After leaving Ferrari at the end of 1962, he and fellow driver Giancarlo Baghetti started for the new team ATS created by ex-Ferrari engineers in the great walkout of 1961. In 1964 Hill continued in Formula One, driving for the Cooper Formula One Team before retiring from single-seaters at the end of the season and limiting his future driving to sports car racing with Ford Motor Company and the Chaparral Cars of Jim Hall. During the 1966 Formula One season, Hill often participated in race weekends behind the wheel of a Ford GT40 prototype, accompanied by a remote-control Panasonic camera in order to produce images for the movie Grand Prix. In that same season, he entered his last ever Formula One race, the Italian Grand Prix at Monza, racing for Dan Gurney's All American Racers, but he failed to qualify. Hill retired from racing altogether in 1967. Hill has the distinction of having won the first (a three-lap event at Carrell Speedway in a MG TC on July 24, 1949) and last races of his driving career, the final victory driving for Chaparral in the BOAC 500 at Brands Hatch in England in 1967. Hill also drove an experimental MG, EX-181, at Bonneville Salt Flats. The "Roaring Raindrop" had a 91-cubic-inch (1.5 L) supercharged MGA twin cam engine, using 86% methanol with nitrobenzene, acetone, and sulphuric ether, for an output of 290 HP. In 1959 Hill attained 257 mph in this car, breaking the previous record of Stirling Moss in the same car, 246 mph. Following his retirement, Hill built up an award-winning classic car restoration business in the 1970s called Hill & Vaughn with business partner Ken Vaughn, until they sold the partnership to Jordanian Raja Gargour and Vaughn went on to run a separate business on his own in 1984. Hill remained with Gargour at Hill & Vaughn until the sale of the business again in 1995. Hill also worked as a television commentator for ABC's Wide World of Sports. Hill had a long and distinguished association[according to whom?] with Road & Track magazine. He wrote several articles for them, including road tests and retrospective articles on historic cars and races. He shared his "grand old man" status at R&T with 1960s racing rival Paul Frère, who also died in 2008. Hill, in his last years, devoted his time to his vintage car collection and judged at the Pebble Beach Concours d'Elegance more often than any other individual; 2007 was the 40th time he had judged the event. Hill was married to Alma, and had three children: Derek, Vanessa and Jennifer. Derek raced in International Formula 3000 in 2001, 2002 and 2003, but was forced to retire when Phil became ill with Parkinson's disease. After traveling to the Monterey Historic Automobile Races in August 2008, Hill was taken to Community Hospital of the Monterey Peninsula, where he died after a short illness from complications of Parkinson's disease in Monterey, California, on August 28. In 1991, he was inducted into the International Motorsports Hall of Fame. He was inducted in the Motorsports Hall of Fame of America as the sole sports cars driver in the inaugural 1989 class. ^ a b Daley, Robert (1963). The Cruel Sport. 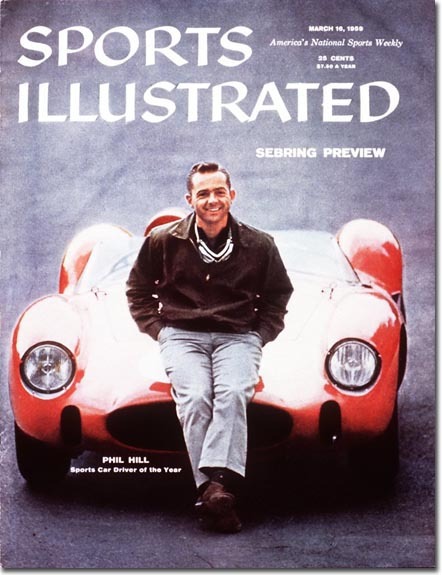 ^ Jim Peltz, Phil Hill dies at 81; only American-born driver to win Formula One title, Los Angeles Times, August 29, 2008. ^ Weber, Bruce (2008-08-28). "Phil Hill, a Racing Legend at Odds With the Sport at Times, Is Dead at 81". The New York Times. Retrieved 2008-09-13. ^ Roberts, Andrew (21 December 2016). "Grand Prix: 50 years since the greatest racing film of all time". The Daily Telegraph. Archived from the original on 3 January 2018. Retrieved 3 January 2018. ^ "Italian Grand Prix – A Real Italian Victory". Motor Sport (October 1966): 38–41. 4 September 1966. Archived from the original on 3 January 2018. Retrieved 3 January 2018. ^ "The MG EX 181 – Specifications and Pictures". Silodrome.com. May 28, 2011. Retrieved December 10, 2017. ^ "8W – Who? – Phil Hill". www.Forix.com. Retrieved December 10, 2017. ^ Posey, Sam (September 2011). "A Man Like No Other". Road & Track. 63 (1): 92. ^ "American racing legend Phil Hill has died". autosport.com. August 28, 2008. Retrieved August 29, 2008. ^ Peltz, Jim (August 29, 2008). "Phil Hill, 81; first U.S.-born driver to win Formula One title". Los Angeles Times. Retrieved December 10, 2017. ^ "All Results of Phil Hill". racingsportscars.com. Retrieved October 4, 2017. ^ "Phil Hill – Involvement". statsf1.com. Retrieved January 15, 2019. ^ a b c "Phil Hill – Biography". MotorSportMagazine. Retrieved January 15, 2019.